Our 2014 NSTRA trial will be held April 12th and 13th in Benge, WA. For those of you ready to take the plunge into a higher level of competition, SRSGDA also sponsors trials sanctioned by the National Shoot to Retrieve Association (NSTRA). These trials offer us the opportunity to test our dogs against some of the top dogs in our region and nationally. 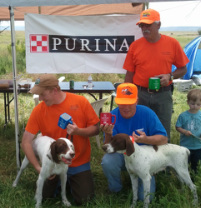 Our annual, NSTRA trial is held in April, It also serves as the primary fundraiser of the year for our club. If you are interested in competing at this level, or would just like to come experience a trial and help out the club, there are many opportunities for participation.